So as you know, I’ve been trying to ages to make macarons. Something always goes wrong. But Friday I managed to make a decent batch of red velvet macarons. I was so excited. Then I got distracted with making tea masala, and then had a fantastic idea. 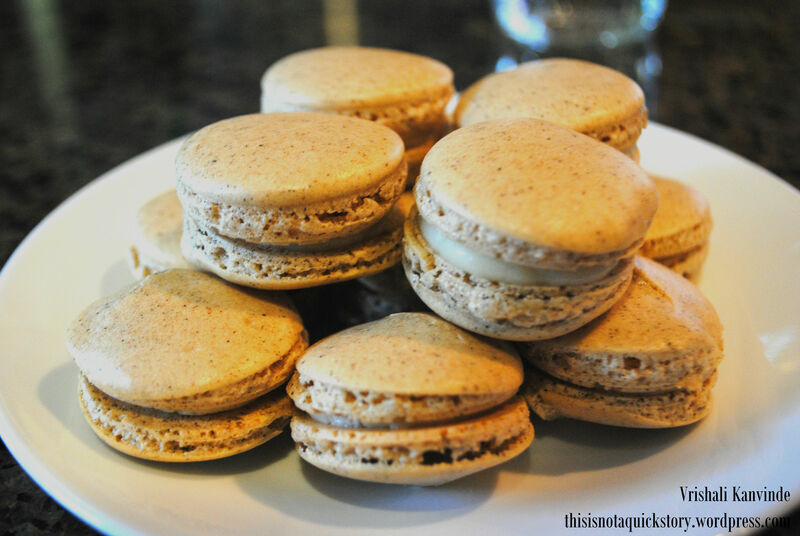 What about masala chai flavored macarons?! I mean, it’s not too far off from the red velvet. Instead of adding cocoa powder and red food color, I just need to add tea masala and tint the batter brown-ish. Easy enough. I was so excited. And they taste amazing. The frosting I used was the same cream cheese frosting for the red velvet ones, and that recipe is here. You can buy tea masala in any Indian store, but since I only needed a little and had the ingredients on hand, I made it myself. For this recipe it was about five cloves, two cardamom pods, a teaspoon of ground ginger, a teaspoon of ground cinnamon, and a pinch of black pepper, all ground up and sifted to a very fine powder. There has to be life outside of grad school.